Did a fresh install of OS 13.2 over xmas and all [Wine/Winmx]was working fine, until yesterday. I was not happy with having to adjust the Winmx window size every time I restarted Winmx. So I clicked on the icon at the top left of the winmx window and went to >More Actions>Special Application Settings>Size and Position window opened. I proceeded to adjust the starting window position and size to what I thought I would like it to be. I changed that only and OK'd out. I went back into " More Actions>Special Application Settings>Size and Position window" and tried to 'UNDO' what I changed, but Winmx still would not start. In desperation, I uninstalled and reinstalled Winmx. Still the same error MSG. I opened Wine config and in the graphics section I changed it to "Emulate a Virtual Desktop". I tried starting winmx and it started. I changed it back to "Let the window manager control things" and got the error MSG again. I changed it back to "Emulate a Virtual Desktop" again and it worked. 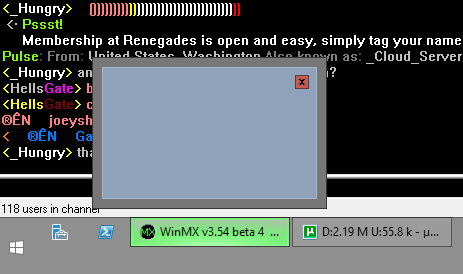 I have never run Winmx under these conditions before, I always let the Window manager control things before. Is this a Wine to Linux problem? Is there a downside to running Winmx in a Virtual ? Is there a way to fix this, so that Winmx runs thru the Window Manager? Should I have started this as a new thread? 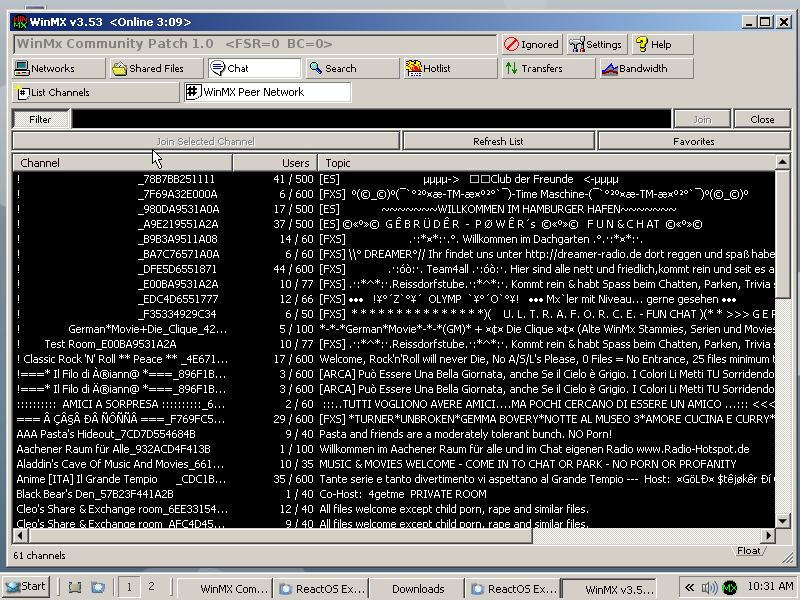 ...personally i have winmx running in a windows xp vm so all the little toys, like leechammer, play nice without bothering my actual desktop..
is it possible to run "all the little toys" if I leave Winmx in the vm thru wine [as described in OP]? Should I be taking these questions to the Winehq forums for answers? or where else? Since I have started using Winmx - seems like a lifetime ago - 15 or 20 years ago - all thru the different OSes i have used, this error msg [Winmx has encountered a serious error...] has been appearing. Can anyone tell me why it occurs and how to correct it? I am getting it now in the wine vm. 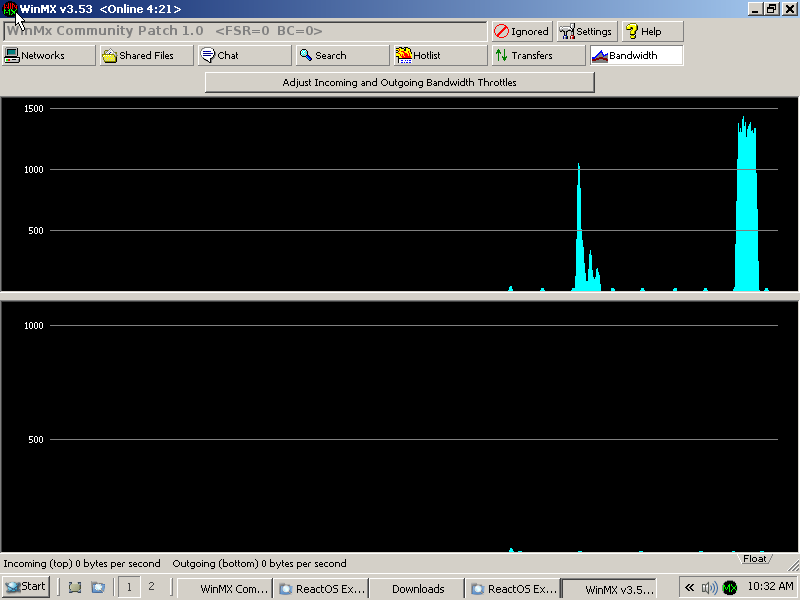 It is annoying beyond belief at times because, of course, there is nothing to do but reboot winmx to get rid of it! On another note: Will Winmx ever be replaced with "ourMx". Is "ourMx" ready to use by ordinary users, yet? This is all I get with Windows 8 for the thumbnail thing. I think it was the same with Windows 7 like Silver said. Personally I don't get the "WinMX has encountered a serious error..." thing. Sometimes I have WinMX running for 50 days without incident. It has crashed on me so long ago I can't even remember when the last time was. The only issue I have with it is when the 32-bit uptime tick counter gets full (49.7 Days of uptime) that WinMX shits itself and has to be restarted to make its UI functional. When OurMX is ready for another release, it will be announced. 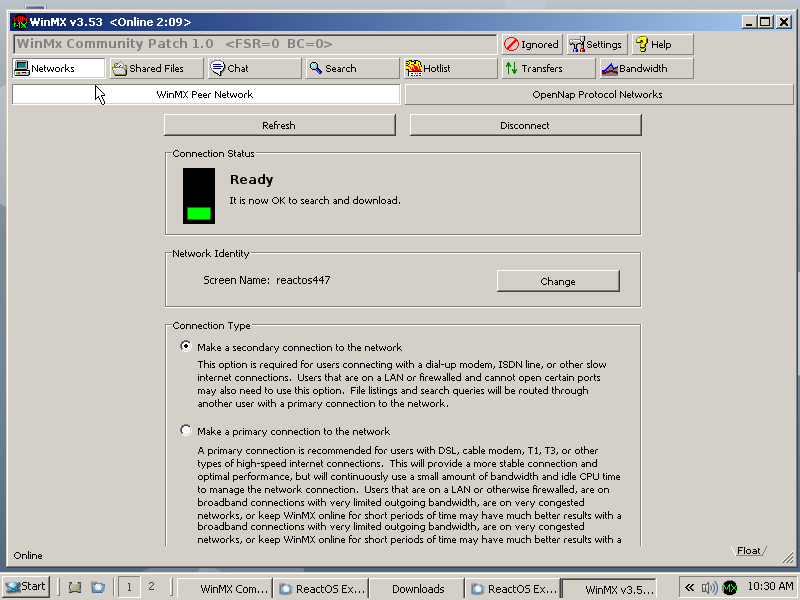 If it is acting funny on Wine, it should be tested on ReactOS too. That is for sure. They were using a mixture of their own and LwIP, though they were supposed to be moving more toward LwIP so the code there would be more consistent. Are you sure you tried a recent version? You should try a recent trunk build. The reason I ask is that it looks like the old explorer.exe is in use in the screenshots. The crashing tends to show that maybe the memory manager needs more work. I keep up with ROS, but it needs a lot more work, and more able developers who are willing to volunteer. Are you sure you tried a recent version? No, the new shell was added to the daily builds, not an official release. It has been in the trunk since 11/26 of last year. But I wouldn't try any trunk revision immediately after the new ROS Explorer merge. (By Explorer, we mean explorer.exe that does the GUI and the taskbar, not the Internet.) The reason I say to not go that far back is because there were some "ah s**t" bugs. As you may know, they use as much WINE code as they can, but it has to diverge in certain places since it has almost a Windows kernel. Well, they forgot to exclude some code from the WINE-syncs, so Windows compatible code was replaced with WINE code, and non-English users couldn't use it. Gigahertz tried hard to find why the localization code wasn't working and then found the code to handle that was overwritten by a WINE-sync. The syncs are usually a good thing, since if the WINE team improves code or makes things closer to Windows, then that is effort the ROS team won't need to take. The more code they can farm out to other FOSS projects, the more they can concentrate on what is left. SMF 2.0.15 | SMF © 2017, Simple Machines Page created in 0.044 seconds with 24 queries.